Porch gliders are ideal for any porch. Whether your prefer an Adirondack glider, metal gliders, vintage gliders, or an outdoor furniture glider; the soothing sway is relaxing and a great way to enjoy a good book, glass of wine, or just take in the view. Because they don't need overhead support, gliders are easily moved to avoid wind or rain on your porch and offer additional seating on large porches. We've had several gliders over the years and find them to be both relaxing and ideal for porches, decks, and patios. For porches with limited space, gliders may be just the answer. My mother and grandmother loved to sit on their glider every evening; it was one of their favorite places to watch the world go by. For those with mobility issues, a glider is somewhat safer than a porch swing. Whereas a porch swing has the tendency to float backwards when first seating, an outdoor furniture glider can only move a set distance. Gliders come in a variety of materials, finishes, and styles. You can find gliders in wood, resin, metal, wicker, recycled materials, and more. Add cushions and you'll have a beautiful piece of outdoor furniture you can enjoy for years to come. When selecting a glider for your porch ensure you find a quality product that will hold up to not only the weather but constant use as well. Ensure the glider mechanism is well built - it's the essence of a glider. If you are considering a wood glider (the most popular) you'll need to maintain it over the years as you would any other wooden outdoor furniture. Want time alone or have very minimal space? A chair glider my be your solution. Chair gliders have the benefit of regular gliders but with half the space. We've included a small sampling of gliders with corresponding links for more information to show you the many options and styles available. You can find wood gliders in a variety of woods ranging from cedar to balau, oak, eucalyptus, fruit tree hardwoods, and more. They will require regular maintenance depending to what types of weather they've been exposed. 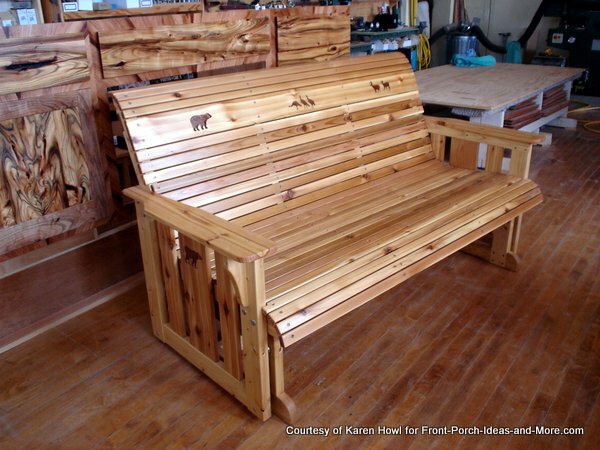 See more in our wood porch glider section - link below. Metal gliders are known for their durability and beauty. You'll find metal gliders in wrought iron, aluminum, and a few other metals. Many combine wood and/or fabrics to enhance their beauty and comfort. 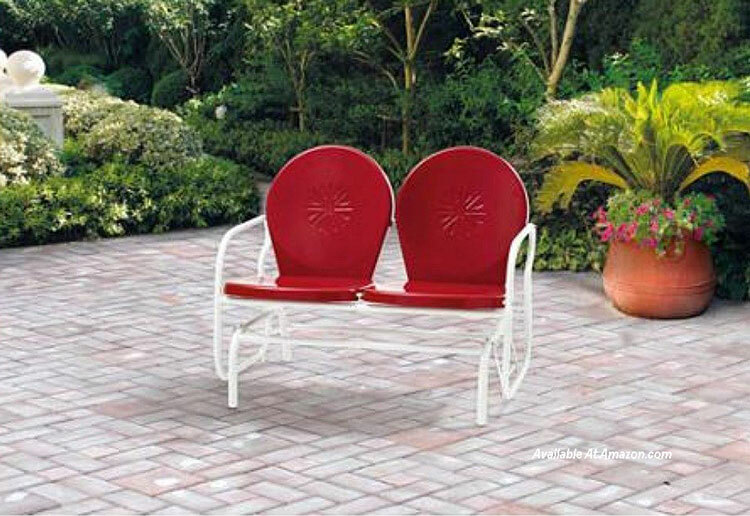 Sized for any porch, chair gliders offer comfort for a small space. Whether on your porch, deck, or patio, these gliders are perfect for creating a restful little nook. 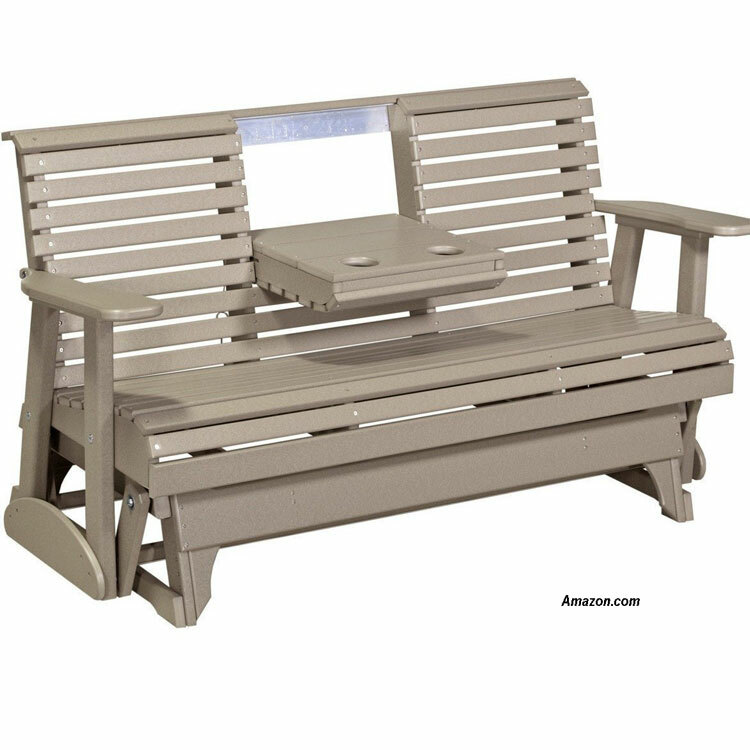 See more metal glider options in our metal porch glider section. Recycled gliders offer a wide variety of colors along with traditional and contemporary styles. They are extremely durable and can add lots of color to your porch, deck, or patio. See more recycled glider options in our plastic glider section - link below. Retro furniture is still in demand not only because it conjures up lots of memories but also because it is very comfortable and looks amazing. Fortunately, you can find lots of vintage looking outdoor furniture that will look great on your porch, deck, or patio. Get ideas for this innovative glider option: recycled plastic!